Looking for AncestryDNA coupons and discounts? How Much Does AncestryDNA Cost? The best place to find a good Ancestry DNA coupon is on their official website, Ancestry.com. You can see all their latest discounts and offers here. 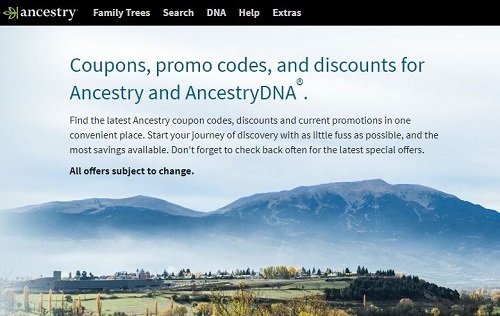 There are plenty of coupon websites like Groupon that carru AncestryDNA coupons, but in all honesty they are usually the exact same discounts AncestryDNA provides on their website. A decade ago, you had to pay thousands of dollars to get a DNA test. Today, most test kit companies offer them for less than $100. Ancestry.com’s autosomal DNA test normally goes for $99. And with an Ancestry DNA coupon, you can save big time – usually there are discounts of $10-30 running. For your money, you get an in-depth report detailing your ethnicity breakdown, a historical timeline showing your ancestry roots hundreds of years back and migration patterns for your ancestors. You also get access to the largest DNA database in the world. You’ll discover unknown family members and get a chance to connect with them. Read our full AncestryDNA review to learn more about this test and how it can help you discover more about your family and ancestry. If the $99 price tag still sounds a bit much for you, there are a few ways to save money. The obvious one is the one I just mentioned above – coupons and discount codes. AncestryDNA gives them out frequently. Visit their website to see their latest offer and select an Ancestry DNA coupon. My favorite trick, whether I want to buy an AncestryDNA test or I’m eyeing an appliance on Amazon, is to wait for the right time when prices suddenly fall. Companies love giving offers so they find all kinds of excuses to drop their prices. You don’t have to wait long. The best times to look for deals on AncestryDNA is during family-centered holidays – the biggies include: Black Friday, Cyber Monday, Christmas, Father’s Day, Mother’s Day and Valentine’s Day. For example, this past holiday season offer where you get $40 off your AncestryDNA kit. Instead of paying the usual $99, you can snag one for $59. They also cut their Ancestry.com prices by 20% for a 6-month or 12-month gift membership. AncestryDNA and Ancestry.com subscription are two different services. Payment for one doesn’t include the other. Many people are often frustrated when, after paying for an AncestryDNA test, they discover they cannot build a family tree or access genealogical records without an Ancestry.com membership. Luckily, you can enjoy Ancestry.com’s additional services without paying the subscription fee. But only if you are quick. Ancestry provides a free 14-day trial. You’ll access all the perks of your chosen membership during this period. This is just for cursory research to find out if there is more about your family to be discovered. This is because once the trial period expires, you lose access to your family trees, genealogical records and you can no longer message other Ancestry members. Use the two weeks to determine if you should dig deeper. If you find interesting stuff, pay for a full subscription. If you don’t find anything, you’ll have saved yourself some good money. Note: You’ll have to provide a valid credit or debit card when signing up. Remember to cancel two days before the expiry of the trial period to avoid an automatic charge on your card. I’m one of those shameless people who tell friends and family exactly what they should get me for my birthday. If you are like me, Ancestry has a handy feature that lets you ask someone to gift you an AncestryDNA test. You can send a request via email. If you are not bothered about searching for an Ancestry DNA coupon, then this is the best option for you. This is not exactly a money saving idea. It’s just a way to get more out of your DNA test. You’ll still have to pay $99 for the test or wait until there is an offer. Once your test results are in, go to your Ancestry Account and download your raw data. Upload that data to Family Tree DNA to get more matches at no cost. You can also pay $19 to access the chromosome browser and other features to help you track down your ancestry origins. There are several other sites where you can upload raw DNA data for additional analysis. The free ones are MyHeritage DNA, GEDMatch, Genomelink and DNAGedcom. Promethease is another popular site for health analysis. Each report costs $12. If you need a DNA test right now and you are unable to find any AncestryDNA coupon, offers or discount codes, you could always look for a cheaper alternative. My top two budget recommendations are MyHeritage DNA ($79) and Geno 2.0 by National Geographic ($59.95).